Discussion in 'iPad Accessories' started by TheRealDamager, Nov 24, 2012. Just received and installed the black carbon fiber skin for my IPad mini. Thought I'd post some info and pics. I like to skin my Ipads and Macbooks - it provides great scratch protection without adding a lot of weight or ruining the size and shape of the device. 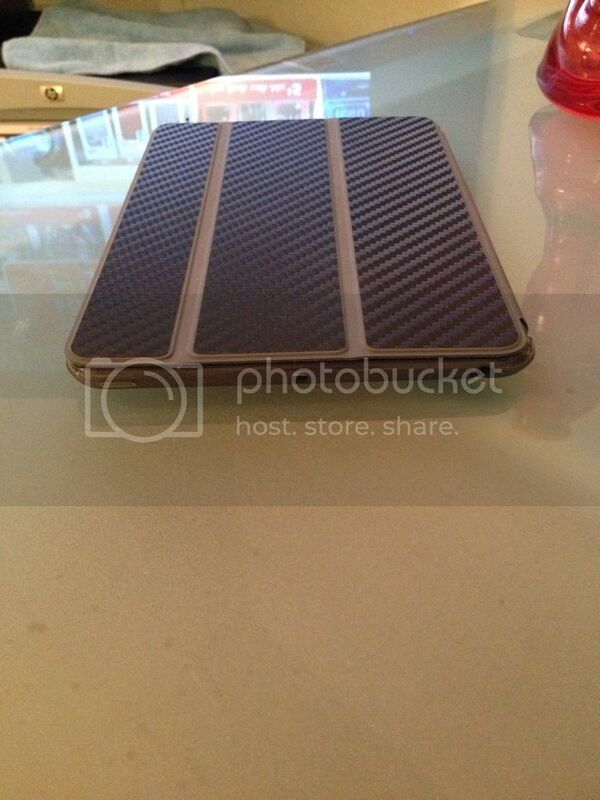 I ordered the black carbon fiber skin for my black IPad Mini. Fit and finish is excellent, and installation is very easy - not nearly as error-prone as the wet-install skins. Spend a lot of time staring at the back of your iPad, do ya? I have a small sticker on my iPad screen - "This side towards user". THey have 6-7 different types for the mini - this was the only black one, and I wanted to keep the black color. that looks awesome! great fit..
Where did you get the case for your ipad mini and who manufactures it? Thanks in advance! Hey glen e, I just wanted to say thanks again for the timely reply. I've been having difficulty trying to find a full body cover for my mini, so I appreciate your response. I checked on Amazon, but the case I received was very poor quality (sagged on the bottom of the mini. It was a gel/plastic type material from Iblaston). Take care and I hope you have a good Christmas! do you have any recommendations on where this case can be obtained? I was tracking that. I came up with nothing on Google. I'll check out switcheasy.com for the back. Thanks again again glen g. I appreciate it.